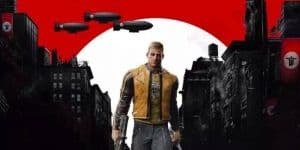 Wolfenstein 2: The New Colossus Art Book | Nerd Much? The collection will come first in hardcover form and made available after the game is due on November 7, 2017. The game will release on October 27, 2017. Unfortunately, there doesn’t seem to be a way to pre-order the book yet, and it doesn’t come with the collector’s edition either. Wolfenstein 2: The New Colossus, as we saw back at E3, takes place in an alternate universe where the Nazis won WWII. They’ve taken over the world with their extremist ideology and forced, oh no, every citizen to learn German. Of course, there are plenty more terrifying things that the Nazi regime integrated. It is because of these unnamed terrors that the player takes on the role of BJ Blazkowicz, who is a member of the Resistance against the Nazis. A humanity’s last hope for freedom, it’s up to the player to tear through enemy lines, kill more Nazis than humanly possible, and usher in the second American Revolution. You can do so with a variety of weapons, including the Laserkraftwerk, the Dieselkraftwerk, advanced pistols, submachine guns, and hatchets. Once you upgrade, you can even dual wield your guns – just in case Laserkraftwerk isn’t over-the-top enough for you. The hyperviolence of Wolfenstein is a trademark of the series and Machine Games has always delivered on that promise. It’s not so much about the story as it is about the gameplay. The story, more often than not, is a flimsy frame of justification. We do not really need a reason to kill Nazis as long as Machine Games continues make that activity as fun as possible.